It’s daunting to move from an intellectual understanding to changing a major policy, leadership style or approach throughout the company. As professionals one of the things we have all learnt is that in business today we play a number of roles: Advisor, expert, leader and consultant. Although there’s plenty of advice around about how to apply consulting skills in business, it can still be difficult to go from sitting-and-reading-a-book to not-just-thinking-that-this-might-be-a-good-idea-for-some-other-time-but-actually-doing-something-about-it. When we think about the insights neuroscience is creating about how to manage and lead businesses better it can add another layer of complexity. Now you not only have to get people on board you also need to explain why what you are doing works. We see this all the time when we’re working with clients. They’re very curious about the science and most of the insights make sense, but it’s daunting to move from an intellectual understanding to changing a major policy, leadership style or approach throughout the company or just within a particular team. 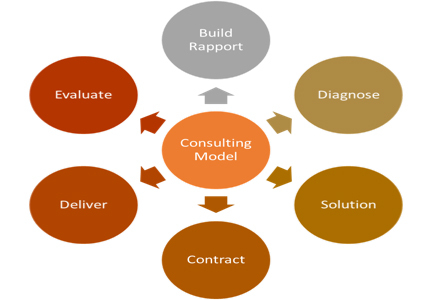 So what can the science tell us about how to make the consulting process work better? Build rapport – Identify and manage key stakeholder(s). Build effective relationships. Talk their language. Use a range of styles to influence and approach. Diagnose – Get own sense of what the issue is. Apply strong diagnostic and analytical skills. Challenge client thinking and perceptions. What kind of data do we need? Who will we speak to? How long will it take? Solution – Feedback the findings – this may encounter resistance from the stakeholder(s). It may be different from what was initially presented. Agreement on how to proceed and what will be delivered. Contract – Contract the scope, deliverables, timetables and resources for the project. Ensure expectations are clear and service standards are agreed. Deliver – Deliver agreed outputs. Apply project management methodologies. Ensure communications. Identify risks to stakeholder(s) to ensure delivery. Evaluate – Continually monitor performance levels and track and evaluate the benefits of all HR related initiatives. If you follow the steps, you will be working in a way that works with the brain, not against it. Let’s be honest – our brain is actually working against us taking what is new and unfamiliar and introducing it. 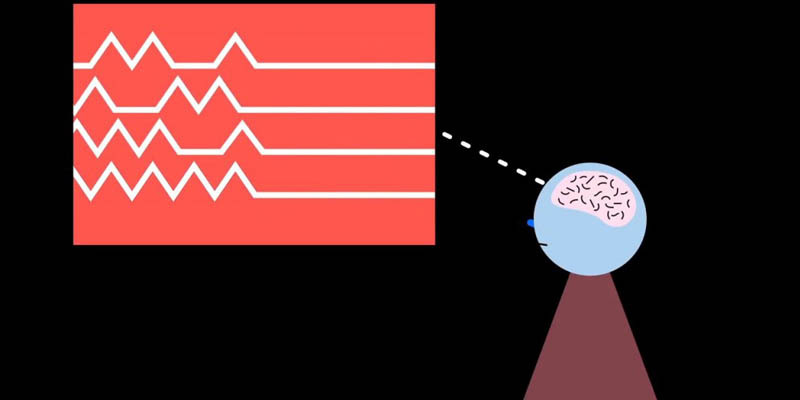 The brain likes novelty but it also likes to be able to predict the future, to be certain. You can’t be certain exactly what will happen in your company or your team if you introduce these ideas. What you can be certain of is this: If you follow the steps, you will be working in a way that works with the brain, not against it. If what you are doing isn’t working…. The trick is to start with the issue which is taking up energy and focus, and try something different. The following steps are designed to get the ball rolling. We’re not suggesting you follow them to the letter – just use them as a guide. Use your own judgement about the speed at which you can introduce change and, depending on your culture and the beliefs and preferences of your stakeholders, how much of the science you need to reveal. We often use the science with our clients ‘behind the curtain’. That is, the science informs the design and structure of what we are doing and it may even be the basis of the policy and process we develop – but it’s not always explicitly mentioned. The change is framed as right for the goals the company is trying to achieve. The advantage of this approach is that people have less to think about and therefore less potential worry, too. On the other hand, some clients are seeking the scientific understanding because they like to know why something works or why it is being proposed. Having this evidence helps them accept the change. You will know which way’s right for your business. Our advice is to take one step at a time, review the results and then move on to the next step. If you are planning to introduce the science you will want to start to get yourself up to speed. Our web site has lots of resources and we wrote our books – Brain-savvy HR and Brain-savvy Business so that you could dip into the parts that were most relevant. You don’t have to be an expert, just to know enough to understand what will help you solve your business issues. We recommend you start with the most pressing issue or the one that promises the greatest potential reward. If that feels high-risk, then think about running a pilot or experiment where you can introduce the ideas in one area where you can monitor the results, and then learn about how the science works in your culture. Feedback linked to negative data will create negative emotions like fear, anger, and doubt. First things first: Think about the root cause of the issue you have. It can be easy to jump to the conclusion that everything’s about there being too much threat and not enough reward, or everyone having a fixed mind-set. Both of these may be true but are they what’s causing the issue? The other trap it’s easy to fall into, is solving the myths in an organisation – the stories that people tell about why the organisation or a department or function is not as successful as it could be. You’ll have heard the stories: “Finance can’t work with HR because they just don’t talk the same language.” Or, “The CFO and the HRD don’t talk to each other.” Or, “Marketing has never really understood the potential for the product.” These stories are often based on past truths or historical problems but may not be relevant now. The first is to talk to a number of people who experience the issue from different perspectives. The most senior to the most junior; the experienced to the novice; those inside the company and those who interact with the company but are not employees, like your customers or suppliers. Gather the data and then reflect on the patterns you’re seeing. The brain is an excellent pattern recognition machine so you should quickly identify what’s reoccurring, what is only seen by one group of stakeholders, or what you notice but no one else has mentioned. Look also at people’s beliefs rather than just the facts. Beliefs will be what drive behaviour and people will filter the facts to meet their own beliefs. The second approach is to pinpoint the teams, departments, leaders or professionals who are working in such a way that they are successful despite the issue. Understanding the difference that makes a difference in their success can point you in the direction of transferring those successful elements to others. We do this through our Success Profile methodology and you can read more about it on our web site. Again, talk to a range of successful people, collect the data and use your brain’s natural love of patterns to help you analyse it. The resulting model will tell you how those successful people are successful – the things they do which make the most difference. Remember, you don’t need to know everything to help others be successful, just the beliefs and behaviours that really matter. Which mind-set, and which type of diagnosis you do will influence the results you get and also impact how your stakeholders respond to the feedback. Feedback linked to negative data will create negative emotions like fear, anger, and doubt. These emotions raise survival energy. It gets people moving and action oriented but it also reduces creativity, problem solving ability and social connection and it can quickly dissipate if the issue seems to be fading, sometimes resulting in issues never fully being resolved. The type of analysis which looks for what’s going right, like the Success Profile method, taps into positive emotions which come with an urge to connect with others, trust and an openness to learning. Whilst this is good it will also feel unfamiliar in many organisation. So you will need to factor this into your decision-making. Take it gently, as some of the science contradicts strongly held views in management, leadership, business and people processes. Once you have a good idea about the root cause (or the success factors of those that are successful despite the issue) Start talking to the people you’ll need to influence and who’ll need to agree with your approach – your stakeholders. Take it gently, as some of the science contradicts strongly held views in management, leadership, business and people processes. People have more insight when they are in a positive mood, when they are relaxed and when they are not focused on the issue but have done a reasonable amount of prior research into it. Too much focus tens to mean people get stuck, going round and round the same data and thinking in circles. The other thing to think about is how the ideas might create a sense of threat or reward. Our work on threat and reward will be helpful here and guide you in planning your tactics to influence stakeholders. Another thing to consider is whether people really want to solve the issue or is their mind-set that it is just the way the business works? We’ve developed something called the CORE model as a quick and easy way to help understand and manage potential responses in yourself and in other people when influencing people, suggesting change or building a relationship. It’s based on research that has identified that people experience threat or reward in four key social situations (such as are found in day-to-day office life). Understanding when a threat response might be triggered and how it could be avoided or minimised, and when a sense of reward can be created in each of these areas is essential for managing areas like change, performance management, learning – and of course communications. Let’s imagine you’re looking at restructuring a department. This will require staff applying for the newly structured positions, and as a result they may experience the changes as threats or rewards in any or all of those four CORE areas. Moving to a new job can threaten someone’s sense of certainty for a variety or a combination of reasons. Perhaps they don’t have any experience of the new role, and they may not have worked under that line manager before. Maybe they’re just not confident of their abilities in that area. On the other hand, if they’re given some options about the roles they can apply for, the location they might be working in, or their job structure or title, they may well perceive a reward in that other CORE area. Given that the workplace is a social environment, it’s clear that reputation and hence social standing matter a lot. How they perceive their standing relative to others affects how they react to their colleagues, how they’re motivated and how they perform. So having got the job they applied for, they may feel their reputation and their responsibilities within the team have been enhanced. Why do CORE responses matter? Whether people feel a threat or a reward will have a significant impact on their ability to solve problems and make decisions, the amount of stress they experience, their ability to collaborate and their motivation more generally. 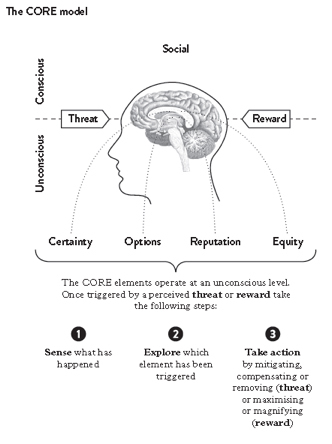 Knowing the drivers that cause a threat response makes it possible to devise ways to minimise them, and understanding those that can activate a reward response makes it easier to motivate people more effectively. In a stable environment there’s clearly a big advantage in being able to recognise these many responses, for example by using them to light up reward pathways using methods other than the conventional ones like pay rises or promotions. In times of change, however, understanding these responses is even more important. When the status quo is disrupted people will be constantly and unconsciously scanning for ways in which they are threatened in all of these CORE areas; they’ll be the subtext of every team meeting and the subject of every informal conversation. Scanning for and analysing these perceived threats will, on a physiological level, divert resources from people’s prefrontal cortex, that part of their brain responsible for planning, analysing and driving goals. And the result of this is as you might expect: Performance and productivity will suffer, decreasing morale and maximising disruption at a critical time. However, if we can shift a perceived threat from an unconscious level to a conscious one, it can be addressed. This could be as simple as giving a explicit, categorical assurance of security or continuity, or devising alternative rewards that will compensate for threats. You can use the CORE tool to design and monitor the results of your change plan, and also look at the case study in the same Principle as well as the section about threat and change. Once people begin to see the value of the science, you should map out how you might apply it and what people will need to be able to do. How big a change is this? Will they need training? Or will you need a formal change plan? What do you anticipate the challenges will be? How can you create a plan to overcome the challenges? What are your measures of success and how will you monitor them in real time to check you are getting the results you desire? What will you do if you face resistance? Also decide if you are going to use the science ‘behind the curtain’ or in front of it. Are you going to follow the scientific insights but not explicitly discuss the science? Whichever method you use, getting people involved in the change is what’s important. Not only do you harness the collective wisdom of the business but you also reduce feelings of threat. You can use the CORE tool to design and monitor the results of your change plan, and also look at the case study in the same Principle as well as the section about threat and change. Many change efforts, be they big or small, fail because the change team stop too soon. This also happens to individuals: You think you’re in the habit of going to the gym or connecting with the team or taking more time to listen – and then things get tough and you forget to do it. Most of what we do is habit rather than intentional behaviour. This is because our brain seeks to operate in the most energy efficient way. Helping people to understand how habits are formed and supporting and celebrating the new behaviour for long enough to make it a habit is what creates real change. No one knows how long it takes to form a habit but it is longer than a week or even a month. So keep going and give people the support necessary to embed the new behaviour.